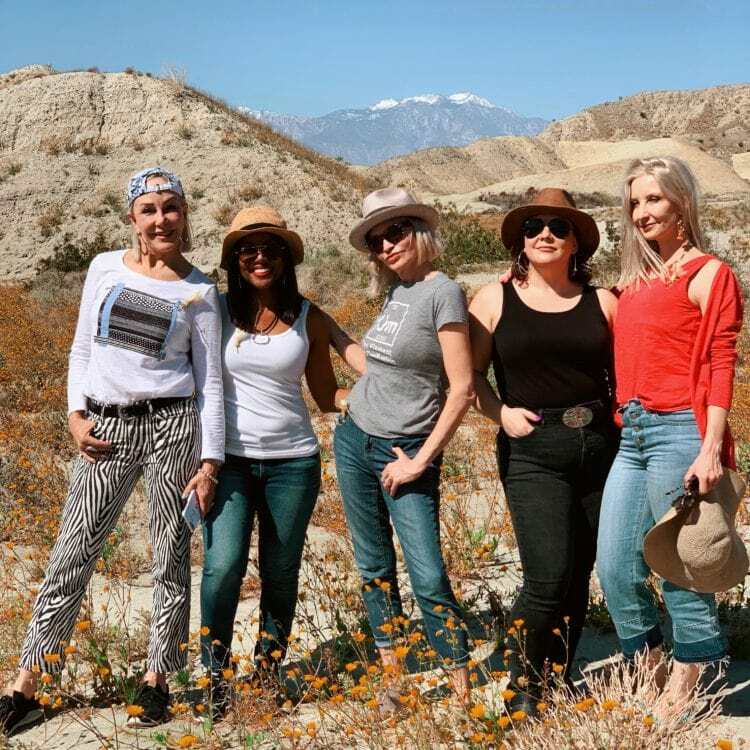 Seeing the Coachella Valley for the first time with Sheree, Tonya, Jamie, and Dawn Lucy. Friday, 7:45 am, a black car arrived at my house to take me to the airport. By 5:30 pm I was at the most adorable boutique hotel in Palm Springs with the clothing brand Chico’s and some of the loveliest people in the influencer game. Through Monday at noon, we took plenty of pictures and shared Instagram Stories, but I didn’t have a single moment to check email, write content, or do all the administrative things for my blog. And damn, was it amazing. Blogger trips can look so glamorous, but they're a business trip, just with photoshoots instead of board meetings. You fly in and get right to it, fly out after a long day chock full of events. You get up early, you go to bed late, and have your day scheduled to the last minute. Each activity is a photo shoot with a certain dress code. You’re laughing more than you normally would, sucking in your stomach, sitting straighter because there’s a photographer capturing all the “candid” moments. You get pumped up with too much coffee and get relaxed in front of the cameras with too much champagne. Don’t get me wrong, these trips are freaking amazing and I am excited each time I am invited, but they aren’t relaxing. This past weekend was relaxing. Chico’s did have a full itinerary, but they also had pockets of time for naps or just being alone. There was a photographer only at one of the events. There were only five influencers, and we all had either met each other before or were virtual friends for a good amount of time. It never felt like work, it felt like a retreat. We bloggers didn’t feel competitive, we shared ideas and tips to help one another succeed. We ate food, we didn’t just Instagram it. There was more tea consumed than coffee and alcohol combined. We laughed until we snorted, we looked out for one another, and we had a blast with the Chico’s staff who have become friends after all this time working together. Before I went, I felt exhausted physically and mentally. I normally do this time of year. There’s the rush of the holidays, which is a busy time personally and the busiest time for a blogger. January is usually a slow time for blogging and a time to reflect and plot out the new year but for my family, it’s four birthdays – me, my daughter, my sister, and my mom. And Girl Scout cookie season. Then taxes. And then it’s mid-March and I feel woefully behind and slightly sad and not until March 20th do I remember that my dad died on March 19th and that is also contributing to that not really liking this time of year and feeling lost. But this trip, instead of adding to my exhaustion was just what the doctor ordered. I was riding in the back of a Jeep through the desert with these women and I began to tear up. If I didn't begin to blog to “look busy” at a new job back in 2005. If in 2017 I didn't decide to end the year by ending my 10-year career at my day job and focusing on this full-time. If I didn't have Wardrobe Oxygen and put so much heart and effort into it there's a very good chance I would have died without ever seeing this beautiful part of the country. It reminded me of when my blog provided the opportunity for me to visit Santa Barbara a couple of years back when I was still at my day job. I was in this gorgeous part of the country and I hardly saw it because every minute I wasn't at the conference I was in my hotel room working. That trip was a big reason why I chose to quit my day job. I worked hard and I was being rewarded and I couldn't even enjoy the fruits of my labor. Life is short, I may never again have such an opportunity. That job that asked me to “look busy” when I started eventually got busy, and I started traveling to client sites across the country every three to six weeks. I went to California – twice – but each visit was less than 48 hours. In Monterey, we had about five hours free before hopping in a taxi to the airport. Otherwise, all I saw was a fancy restaurant, my hotel, and the client's conference room. In San Francisco, I saw the campus of Gap which was cool, but otherwise no part of the city. I. took a career risk and left the team for an evening with a high school friend who lived there. We rode a cable car and ate steamed artichokes. The next morning before the sun rose I was at the airport heading home. I left that business travel job for my last job, the one where I stayed for a decade. When I started this last job, I asked to travel less since I was starting a family. I didn't miss living out of a suitcase, but I missed having the opportunity to travel and see this amazing and diverse country. It's so wonderful to have worked to the point where I have opportunities like this weekend in Palm Springs and to know my business so well I could go sway for four days and the blog would still chug along. But this amazing vacation in a beautiful part of this country I had never before left me playing catch-up when I returned to the real world. Both inboxes were overflowing, dozens of comments were waiting to be replied to, calls were scheduled, invoices were due, brands wanted replies and metrics on past campaigns, and I had no content written. Tuesday started before dawn with a child crying that she had pink eye (she didn't), and then was eaten up by an unexpected five-hour visit to the cell phone store with my mom. The day ended and I hardly accomplished a thing. Wednesday I started off with lofty goals – I’d reply to all the comments, all the emails, write a recap of my trip in Palm Springs AND do a photo shoot for a blog post. Well it’s 7:22 pm and there aren't any photos from an outfit shoot to edit for a blog post, and no recap of Palm Springs. However, I replied to most comments on social and the blog, answered around 200 emails, confirmed travel for an upcoming trip, requested product for upcoming blog posts, packed up some returns and hell… even took a shower after the gym. Some days, a shower is an accomplishment that should be recognized and celebrated. A bigger accomplishment is my mindset this week versus last. I’ve had a conversation with a fellow influencer back in January that has been weighing on me ever since. She is a friend, she meant no malice, but it really made me question this profession. I was feeling down because brands were rejecting me due to my low Instagram numbers. She was offering advice, types of content to share, times to schedule it, strategic use of hashtags, to create less blog content and focus on Instagram, activities to take part in that I may not enjoy but would expand my reach, and to consider buying followers to look more valuable. I don’t blame anyone who goes in that direction, the influencer game is hella competitive and few will even give you the time of day if you don’t have a certain number in your Instagram profile. But I didn’t want to do that, and it felt like I would be sacrificing everything important to me. I would have to make brands more important than people, and that has never been the focus on Wardrobe Oxygen. I didn't take her advice, but I kept thinking about it. I scrolled through the Instagram followers of friends and people I admired and saw hundreds of bot accounts in a row, a sign of buying followers. I saw how a photo that two hours earlier I liked and commented on was now deleted from their feed, likely because it didn’t have enough engagement. I saw how three minutes after a photo posted it would already have a thousand likes, all from men from foreign countries (a clear sign of purchased engagement from a bot farm). It made me mad, it made me sad, and it made me wonder if I was just being stupid to not take part. This isn’t a hobby, it’s not just a way to fund my shopping addiction, this is my career that puts food on our table and keeps a roof over my family. Should I play this game to make my financial situation more secure? Or should I just bow out of the whole game before I completely sell my soul? And then Chico’s invited me to Palm Springs. Me, who doesn’t have a kazillion Instagram followers, who isn’t a specific niche with a clear brand, or a curated Instagram feed. I like to think I’m strong enough to not need ego boosts, but I needed this ego boost. I needed some sort of career confirmation that I’m doing just fine without taking part in the game. I take pride in Wardrobe Oxygen. It makes me so happy when a fellow blogger compliments my content, remarks on how much work it must take to produce it. I love doing it, it feels great to have you all thank me for helping you, it's the whole point of this site. And now that I've done a bit of catching up, a bit of crying in the Coachella Valley, a bit of connecting with fellow influencers who truly care about their audiences and their reputations, and a bit of an ego boost from a brand I really respect, I'm ready for creating more fabulous content for all of you. Stay tuned, there's some really great stuff on the horizon! I just love how open and real you are, Alison! I was also so happily shocked at getting invited to this experience with my relatively low instagram numbers. It makes me love Chico’s even more … they respect and reward authenticity! Here’s to keeping it real … real followers, real style, real talk! I am happy to discover your blog! Just signed up! Thank you Alison! thank you for your open and honest post. as a women of a certain age, i’ll admit to still liking a good old fashion magazine, and i know that those photo’s etc are photoshopped to the nth degree and the clothing is usally way outside my price zone…but online, with blogs, i like real people, with real lives…which is what i like so much about your blog….the photos and the outfits in them are real, the content is from the heart and soul and speaks beyond the clothing…thank you for what you do and how you do it. I am so happy that you had the time to play turista on this business trip. I’m sending a shout out to Chico’s for giving my girl and the other ladies a well deserved break. Our desert areas are particularly impressive in the Spring. I am hoping that you got to see some desert wildflowers. I know I’m promoting California again but I’d like folks to know that we’re more than expensive prices, massive fires, and earthquakes. There are so many diverse ecosystems and so many cities and towns, each with their own unique character. OK, enough CA boosting from me. Your honesty, sincerity, and passion brings and keeps many of us here. I am shocked to learn that some influencers use bot (bought!) followers. What for? To increase numbers? To me, that has no value at all. Brands must realize that is going on. What, they don’t care as long as the numbers are above some arbitrary cutoff? Fooey, I say. Keep doing what you’re doing. Keep doing Allie. I rarely comment, but just wanted to echo some of the posts above. I keep following your blog because of the authenticity you display. I am perhaps a little different from your target demographic – mid-30’s, not petite or plus-sized, West Coaster, not even all that into fashion. I happened upon your blog a few years ago through a linked post by another blogger I followed at the time and have been enjoying your writing ever since.. Your Weekend Reads are always a highlight of my week. Keep up the amazing work! I’m glad you got to enjoy this trip—you deserve it! Thanks for all you do writing and shooting such useful and thoughtful posts. I really appreciate your focus this year on not buying so many new things but re-using what you have. Wishing you continued success. You are an amazing woman! I’m glad you had an excellent experience at the Chico’s weekend – they are one of my favorite brands. I love your content which goes far beyond pictures of yourself in the latest style. Thank you for featuring meaningful content as well as beautiful clothes. And especially thank you for your integrity. Ditto to all the above – I admire the work you are doing and enjoy reading (and sometimes buying) based on your photos/reviews. This is so well written, honest and true! I absolutely love your blog and I love that you are the same in real life as you appear online. Completely authentic! Allie, I rarely comment but I have been reading your blog since 2008 (when I found it as a freshman in college looking for a list of ‘closet staples’). I continue to read your blog because I appreciate your refreshingly honest takes on topics ranging from fashion to politics. I always look forward to that point in my morning when I check out your latest content–thank you for keeping it of a high quality and please do keep it up! I wonder if your conversion(?) rate is better than influencers who buy likes on IG, and that’s because your followers trust your judgment and character. Kudoes to Chico’s for recognizing quality. While I have no buisness opining on how you provide for your household, as a reader of fashion blogs, I can spot the phony “bought” ones a mile away. The bloggers have no theme, there’s no singlular message they promote, no clear target market. I specifically follow you because you have a clear message, you have a clear sense of style, and, quite frankly, your figure is similar to mine. You are genuine!! Curvier women already have a hard time getting the fashion industry to recognize that we’re a market. We need Influencers like you to keep our fashion goals out there! We need Influencers that say, “sorry, you don’t go past a size 16 – my readers wouldn’t be intersted” or “sorry, you only use thin models in your ads, my readers don’t see themselves in your message.” You have the ability as an Influencer to push back on behalf of your readers and I hope you keep doing that! I unerstand that every business decision comes with a certain amount of risk in terms of your personal household….but I really believe you can’t go wrong when you stay true to your mission. Keep up the great work! Alison – there’s a reason why your followers stick with you – and have stuck with you for over a decade (like me)! Your authenticity and transparency shine through. And, I am 100% more likely to consider a product or brand you recommend because you have been very clear and honest with your work here. It’s no surprise that great brands like Chico’s recognize that and reward you accordingly! It’s well deserved! And, if I’m being honest, I went to a Chico’s because it was featured here! It’s not a brand I would have otherwise considered. Keep up the good work, girl! I love your blog and have been reading for several years. Your comments influence my purchasing decisions. What I love the most is the authentic voice you have. You are the real deal and not fly-by-night. I adore your Saturday reads and how thought-provoking they are. Your depth is what gives this blog value. Don’t forget that.